World War II has ended. Germany has been defeated. 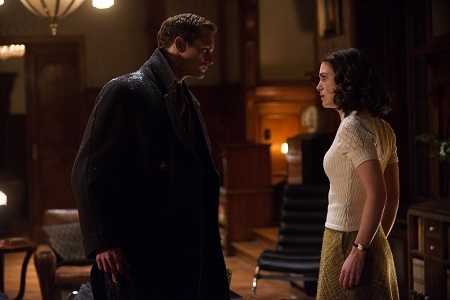 It is 1946 and British Colonel Lewis Morgan (Jason Clarke) is the newly installed governor of Hamburg charged with trying to rebuild the city after it had been bombed into oblivion during the last days of the war. He is joined by his estranged wife Rachel (Keira Knightley), the pair having difficulty rekindling their love for one another after their 11-year-old son was killed during one of the many German bombings of London. The couple have been billeted in the spacious country mansion of architect and widower Stephen Lubert (Alexander Skarsgård), he and his teenage daughter Freda (Flora Thiemann) to be relocated to one of the many shelters the British army has constructed for those left homeless after the destruction of Hamburg. Much to Rachel’s horror, Colonel Morgan decides to allow Stephen and Freda to remain, asking them to move upstairs into the expansive attic while he and his wife occupy the remainder of the house. Initially there is uneasy tension caused by this arrangement. Rachel understandably blames the Germans, no matter if they supported the war or not, for the death of her child. In turn, Freda looks at the British with eyes overflowing in anger and pain, the youngster holding the British and their bombing of Hamburg responsible for the death of her beloved mother. 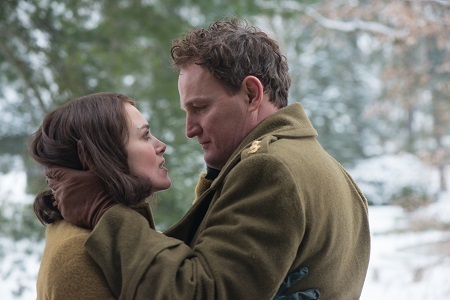 Somehow the ice begins to thaw between Rachel, Stephen and Freda as the trio begin to look at one another with fresh eyes, all of this taking place while an oblivious Colonel Morgan is away for long periods as he faces countless hardships in his attempts to resurrect the German city from the ashes of its devastation. 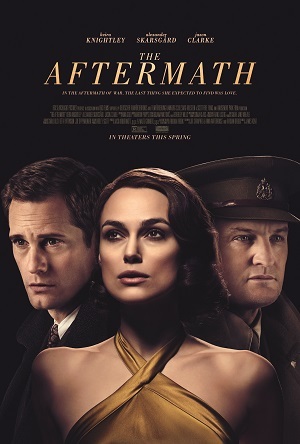 Based on the book by Rhidian Brook and featuring a script co-written by the author and screenwriters Joe Shrapnel (Race) and Anna Waterhouse (Frankie & Alice), director James Kent’s The Aftermath is a war-torn melodrama of empathy, regret, betrayal, grief and forgiveness that frustratingly follows an obvious path. Its saga of a broken marriage and a passionate affair takes place in a postwar world where former enemies, one the victorious occupier, the other the defeated populace, try to learn how to get along even though emotions still run high and compassion on either side is hard to come by. But the inherent tension and viscerally-charged reactions born from such a scenario are oddly muted throughout, and if not for a staggeringly luminous performance from Knightley I doubt I’d have cared one iota for this film or the characters living within it. This is a bit of a shame considering Kent’s last effort, the WWI drama Testament of Youth with Alicia Vikander, Taron Egerton, Dominic West, Emily Watson and Kit Harington, was a bona fide knockout that balanced a somewhat familiar story, overwrought emotions and a complex historical backdrop with superlative ease. But where it felt like the director was in complete control at all times as far as it pertained to the storytelling in that film, in this one it’s almost as if he can’t fully get a handle on the various subplots and characters that are running parallel to the central dramatic thread involving Rachel and Stephen’s blossoming sexual affair. From Colonel Morgan trying to stop German terrorists still loyal to the Nazi Party from killing his men and destroying the army’s rebuilding efforts, to Freda’s romance with a mysterious young firebrand whose intentions might not be as pure as she thinks they are, none of this ends up being as vital to the central scenario that they by all accounts should be. Worse, when all of these various plot strands do finally collide they do so with a heavy-handed thud that’s both obnoxiously coincidental as well as being emotionally disingenuous. It’s moderately unsatisfying, and because of this it doesn’t matter how magnificent Jon Henson’s (Overlord) production design might be or how Max Richter’s (Mary Queen of Scots) delicately nuanced score is so perfectly utilized. I had trouble caring if Rachel was going to make the decision to stay with her husband or if she would instead flee out of the country with the German architect once his travel visa was authorized. This triangle born from colossal grief and inconceivable loss and fueled by an innate desire to feel love in a world where it has come perilously close to being bombed out of existence never affected me on an emotional level. I was left cold by it all, and even a climactic showdown in the snow near a frozen Elbe river didn’t pack the type of punch that could have possibly left anything close to a lasting impression. And yet, none of these reservations means The Aftermath should be dismissed entirely. Kent still stages a handful of poignantly powerful little moments, not the least of which is a spellbinding, almost verbally silent sequence where Rachel and Freda discover a connection while playing Claude Debussy’s “Claire de lune” on a piano. There’s also a splendid bit set just after Colonel Morgan has been interrogating a German bombing suspect being held by the Russians where he’s speaking with his young aide and driver about what war does to those fighting it, Clarke’s performance during this moment so genuinely introspective in its mournful profundity it had me reaching for a tissue to wipe away a couple of tears. Then there is Knightley. While I would not state the two-time Academy Award nominee’s turn as Rachel Morgan is amongst her best performances, that does not make it any less masterful. She cuts to the quick in ways that are oftentimes startling, a hard-edged monologue where Rachel attempts to speak of her deceased son and what she was going through after his funeral to her husband bashing me senseless. But there is also a warmth to Knightley’s overall demeanor that lurks just underneath the surface, even when her character is trying her best to see all Germans as monsters. This allows the lustful passions Rachel ends up bowing to as they pertain to Stephen to carry that much extra weight, and even when the film flounders and has trouble finding its way the actress always seems to be able to re-stabilize the narrative just as it appears it is about to go hopelessly off the rails. In some ways all of that only makes me even more disappointed in what it is Kent has delivered. 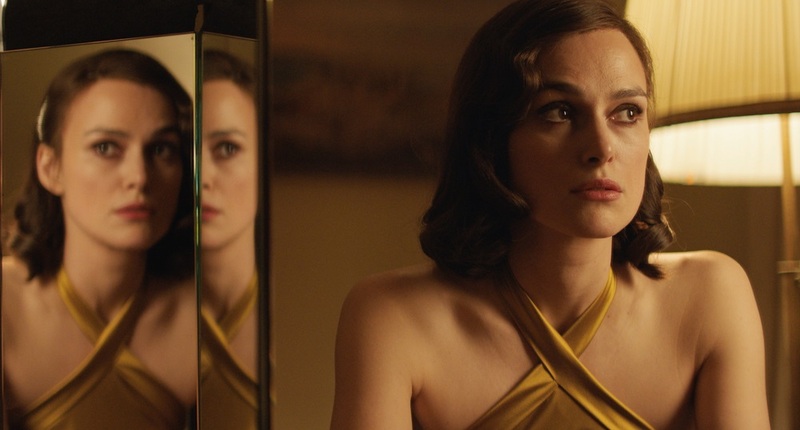 For all of its immaculate production value, as stunning as it might look visually and as marvelous as Knightley is, the film never resonates in a meaningful manner that might end up making it worth a recommendation. While the components are all here ultimately The Aftermath just never rises to the occasion, the war-torn romantic triangle of recrimination, longing and emotional mercy a pedestrianly forgettable affair.